Few are the children who know exactly what they want to be when they grow up. I, at the age of 5, wanted to be a veterinarian. Then an archaeologist. Then a pediatrician. Then a librarian. (We’ll just gloss over the period in which I wanted to become a Canadian.) 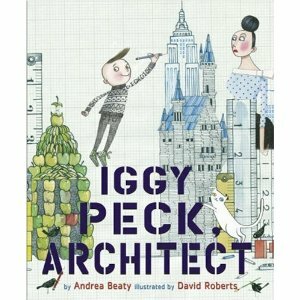 Iggy Peck, however, knows exactly what he wants to be: an architect. From the age of 2, he has been constructing buildings from whatever materials he could lay his hands on..who could forget his tower made of dirty diapers and glue? But when his 2nd grade teacher tries to squash Iggy’s passion for building, you won’t believe how he changes her mind. Andrea Beaty and David Roberts have created a delightful story in rhyme that will warm the hearts of readers young and old.